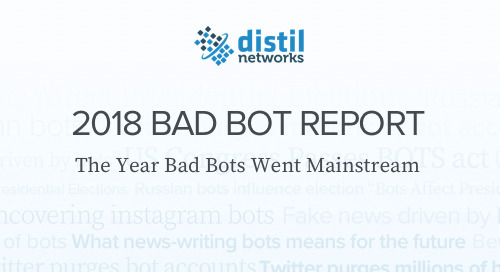 Bad bots are up - In 2017, bad bots accounted for 21.8 percent of all website traffic, a 9.5 percent increase over the previous year. Good bots are also up - They increased by 8.7 percent to make up 20.4 percent of all website traffic. For the first time, Russia became the most blocked country - Russia is blocked by one in five companies (20.7%) implementing country-specific IP block requests. Gambling companies and airlines suffer from higher proportions of bad bot traffic - 53.1 percent and 43.9 percent of traffic coming from bad bots, respectively. They identify as the major browsers - 83.2 percent of bad bots report their user agent as web browsers Chrome, Firefox, Safari or Internet Explorer. 10.4 percent claim to come from mobile browsers such as Safari Mobile, Android or Opera. The weaponization of the datacenter continues - 82.7 percent of bad bot traffic emanated from data centers in 2017, compared to 60.1 percent in 2016. The availability and low cost of cloud computing explains the dominance of data center use. 74 percent of bad bot traffic is made up of moderate or sophisticated bots, which evade detection by distributing their attacks over multiple IP addresses, or simulating human behavior such as mouse movements and mobile swipes. 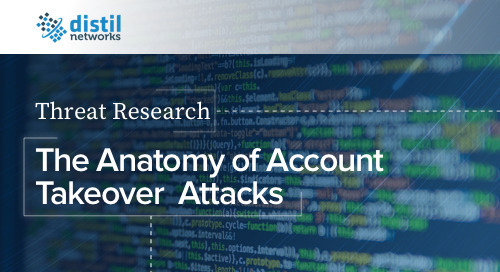 Account takeover attacks occur 2-3 times per month on the average website, but immediately following a breach, they are 3x more frequent - bot operators know that people reuse the same credentials across multiple websites.